On June 27, EPA Administrator Scott Pruitt and Douglas Lamont, senior official performing the duties of the Assistant Secretary of the Army for Civil Works, signed a proposed rule to revise the Clean Water Rule (CWR). The proposed rule, titled “Definition of ‘Waters of the United States’ — Recodification of Pre-existing Rules,” is intended to roll back water protections established by the previous administration. The 2015 CWR, often referred to as “WOTUS,” was meant to clarify the scope of federal jurisdiction in enforcing the Clean Water Act. However, almost as soon as the final rule was published, it was placed on hold by the U.S. Court of Appeals for the Sixth Circuit. At that point, the definition of “waters of the United States” reverted to the meaning that was in place prior to 2015. That definition relied on applicable agency guidance documents, Supreme Court decisions, and longstanding practice when determining if a water was covered by the Clean Water Act. EPA and the Army Corps of Engineers (ACOE) say the proposed rule is the first step in a comprehensive, two-step process to review and revise the definition of “waters of the United States.” This first step proposes to rescind the definition of “waters of the United States” found in the CWR. EPA says this proposal will help to provide continuity and certainty for regulated entities, states, agency staff, and the public. Covered waters require permissions or permits before being altered, a process that can be quite lengthy and expensive. Industry groups, farmers, and states told EPA that its definition of “waters of the United States” was too far-reaching and created unnecessary red tape. In February 2017, President Trump issued an Executive Order directing EPA and ACOE to review the WOTUS Rule. 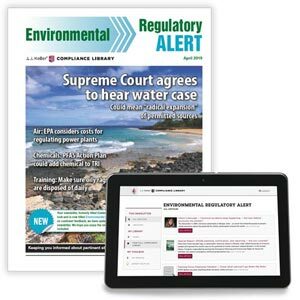 J. J. Keller's Environmental Alert: The Compliance Guide for Safety Professionals helps you stay on top of the latest environmental enforcement issues.